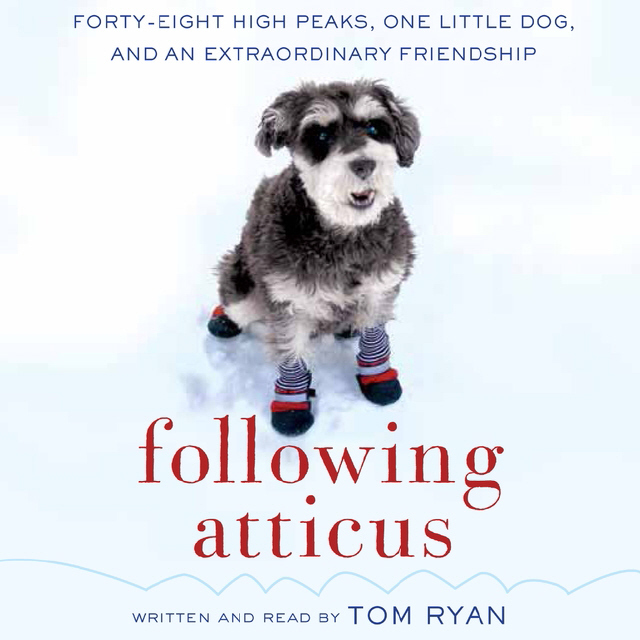 Following Atticus: Forty-Eight High Peaks, One Little Dog, and An Extraordinary Friendship, by Tom Ryan, 2011. From the back cover: "Tom Ryan's lyrical narrative recounts the epic White Mountain adventures he's shared with Atticus M. Finch, his stalwart miniature schnauzer. During one amazing winter Ryan and Finch attempted to hike ninety-six snow-draped peaks in just ninety days. This unlikely duo traversed hundreds of miles through the rugged terrain of the Whites, home of 'the world's worst weather,' battling snow, cold, and wind, and looking upon scenes of unspeakable beauty. This tale alone ensures that Following Atticus will delight dog lovers and mountain enthusiasts alike. But the book will also take the reader on a spiritual journey, as man and dog face unforeseen challenges with grace, courage, and love." -- Steven D. Smith & Mike Dickerman. The paperback release includes an interesting interview with the auhtor. Paperback, 288 pp.